Managers of public buildings like libraries, town halls and leisure centres benefit from accurately knowing their visitor numbers. More and more libraries are reaping rewards from installing people counters. They are using them to save money and increase efficiency. The main reason libraries install people counters in the first place is to prove to funding agencies how many visitors they have. However, a video counting system soon proves itself cost-effective in many other ways. Libraries use the data to improve the visitor experience by increasing staff at busy times and reorganising displays that aren't working. Numbers visiting the library at different times and days are remarkably similar; recording people counts let libraries plan ahead and optimise staff levels. Video people counters use pictures from CCTV to detect and count visitors. 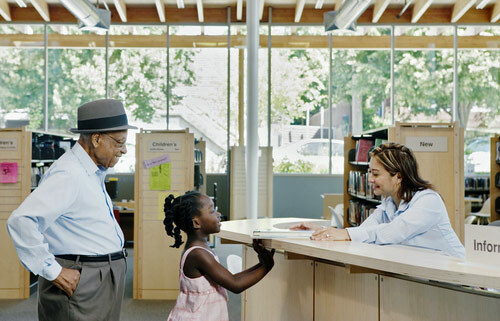 The library can see how many people visited yearly, monthly, weekly, daily, hourly or every 15 minutes. Counts can be stored and displayed both locally and remotely, with data being sent over the internet to administration centres. Systems are 98% accurate: you can verify counts simply by watching the video. More on counting library visitors. Monitor occupancy: which rooms are busiest at the moment? The real-time counts for each area means that the museum can allocate extra security guards or other staff to that exhibit. Items are more often damaged or stolen in busy rooms with few personnel on duty. Many museums are funded by governments, and receive their funding according to how many visitors they get. Video people counting gives a true number of visitors, rather than basing the footfall figure on the number of tickets allocated (for example when a bus-load of children get in under one group ticket). The information collected also enables museums to adapt floor layouts to increase visitor satisfaction and encourage repeat visits.